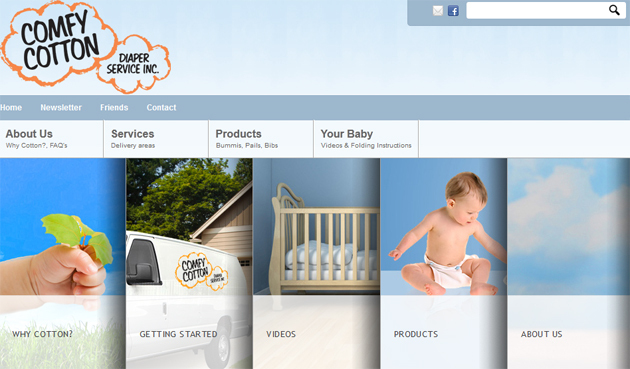 Comfy Cotton is a Canadian company that opened its doors in 1988 and grew to be the largest and oldest diaper service in Toronto and GTA. Located in Markham it serves communities from Courtice (east) to Stoney Creek, Kitchener (west) and from Toronto (south) to Newmarket (north). In the 12000 square foot plant, a staff of more than 35 people process over 4,400,000 lbs. per year of soiled laundry. Laundry services are provided for the retail division, (families committed to the use of cotton diapers for their babies), and for the institutional division, (a combination of Health Care facilities, Universities and Provincial and Federal institutions). The diapers are owned and supplied by Comfy Cotton and ALL diapers must be returned when you arrange for a final pick up. You will be provided with two sets of diapers that will circulate over a period of two weeks. This will allow you to have one set in your home and one set in our plant. We monitor the circulation of your diapers by counting them each week. The final count will be made when you arrange for a final pick up and you will be advised to return all the diapers. We deliver the first set of diapers around 2 – 3 weeks before the baby’s due date. We will NOT return to your home until you call us to resume our service after your baby is born. We normally start a baby with 70 infant diapers. That allows for approximately 8 – 10 changes per day as recommended by Health Care professionals. The amount of diapers that will be delivered weekly depends on the amount of soiled diapers we picked up. Example: If your weekly order is 70 but you have used and returned only 50, 50 diapers will be delivered to you on your next delivery. Our driver delivers in your area once a week and because he is handling more than 100 deliveries each day plus weather conditions, traffic, etc., you may not get your delivery and pick up at the same time. He may arrive at your door early or late on your delivery day. Please continue to leave your soiled diapers outside until the driver has exchanged the bag. We recommend that you place your soiled diaper bag(s) outside the night before your delivery day to avoid missing the driver. Please call our office for options if you missed the pick up. If you missed the pick up and you did not call the office, no delivery of clean diapers will be made to you the following week without your request, we will however send the driver to pick up your soiled diapers. It is essential we collect your soiled diapers each week so that we may clean and return them the following week. Extra charges may apply if soils are not collected or soiled diapers become moldy and damaged. A free carbon filter is provided once every two months to help reduce odor from the diaper pail.